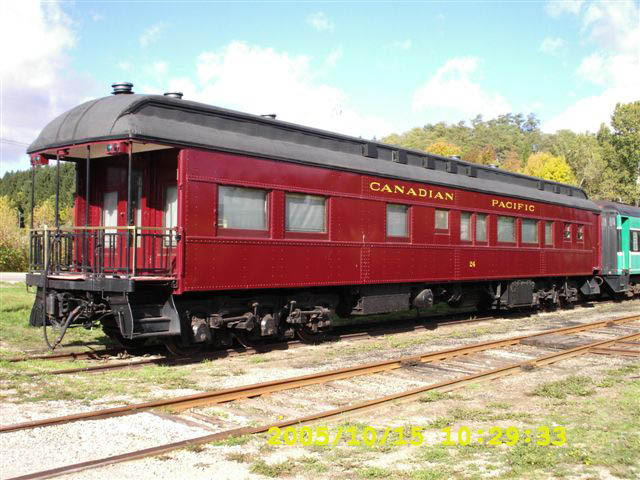 Canadian Pacific Railway's London Division traces its history back to 1873, when the Credit Valley Railway was surveyed for a main line from Toronto through (West) Toronto Junction, Streetsville (Junction with the Orangeville branch), and Woodstock to St.Thomas. 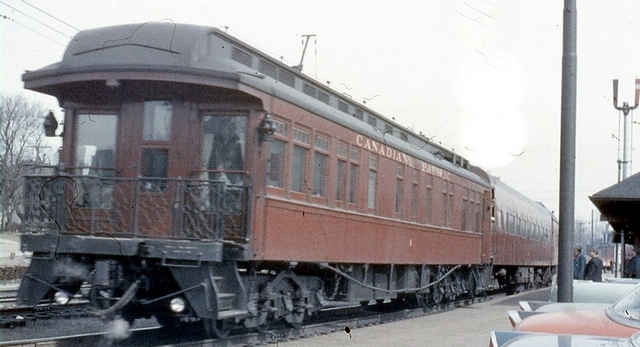 Here the CVR connected with the Canada Southern (CASO), which was headquartered in St.Thomas, and whose mainline ran between Windsor and Niagara Falls connecting with the Michigan Central at both ends. Grading began early in 1874, the Humber River bridge was built by November. Track laying went west from Toronto with service opened as far as Milton in 1877, Galt in September 1879 and St.Thomas in 1881. 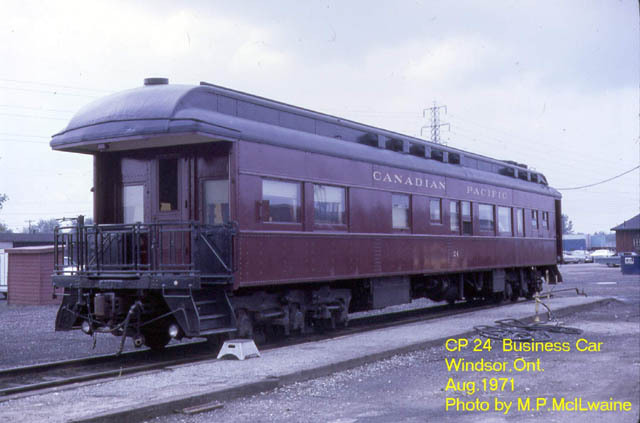 The CVR was taken over by the Ontario & Quebec, and in turn the O&Q was taken over by the CPR in 1884. The O&Q annual report to the Department of Railways and Canals, indicated a total main line of 580.8 miles. 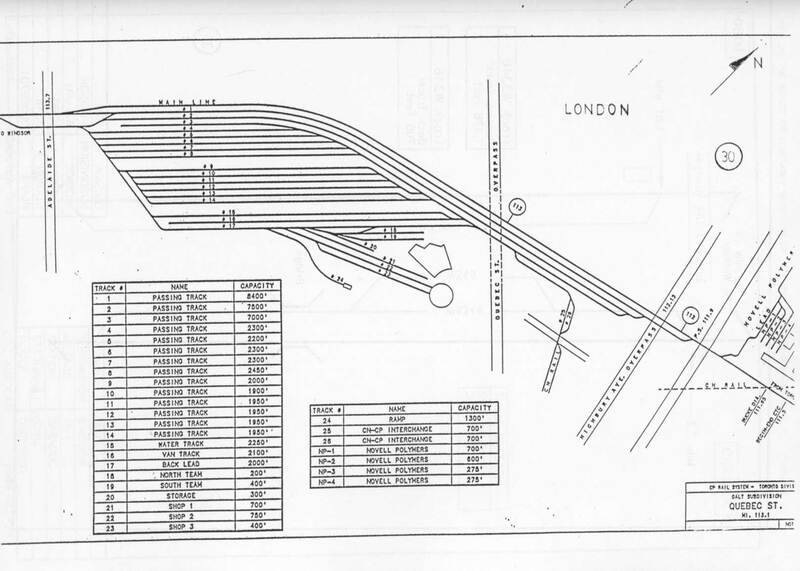 London Division, headquartered in London, Ontario, covered the territory between Windsor and Toronto Terminals, along with a number of branchlines radiating off the mainline. Crews based here work west to Windsor and east to Toronto, as well as at Out of Town terminals such as Chatham, Woodstock, Goderich etc., along with everything operating west of Obico, including two jobs at Lambton, the Cooksville Turn and the Stone train running to Guelph Junction. (Oddly enough, although Guelph Junction is a fair-sized yard, a yard job wasn't posted there.) Two exceptions included Assist engines helping trains out of Toronto westbound to Orr's Lake, and trains leaving the main line at Streetsville for Orangeville and other points. Toronto men manned these jobs even in later years when Orangeville was part of the London Division since the Bruce Branches originally belonged to the Bruce Division. 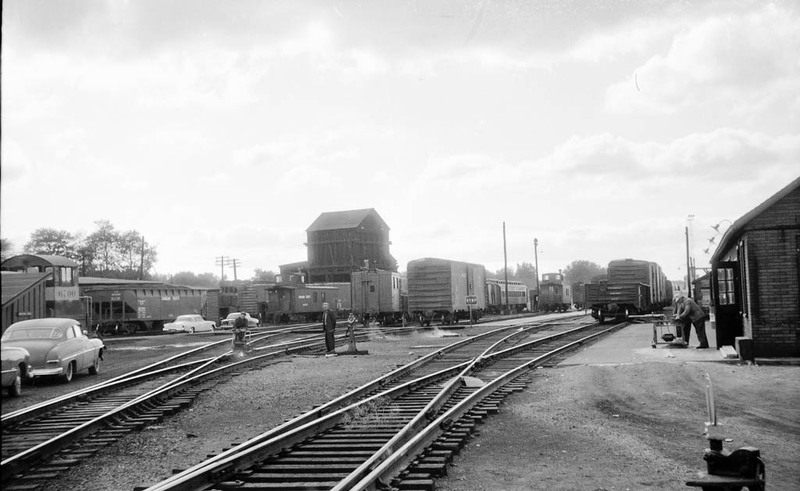 Windsor Yard was home to several yard jobs to switch not only CPR traffic but, also Pere Marquette (later, Chesapeake & Ohio) trains, whose engines were serviced in Windsor roundhouse. 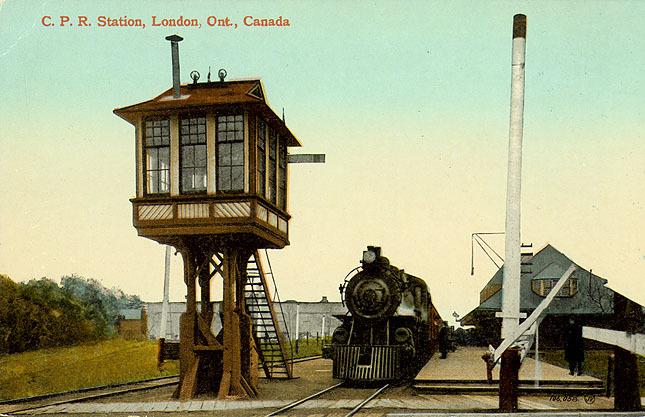 The London Junction Railway was incorporated in 1882 to build from London to Port Burwell. Before anything was built it was leased November 19, 1883 to the CVR for 999 years! 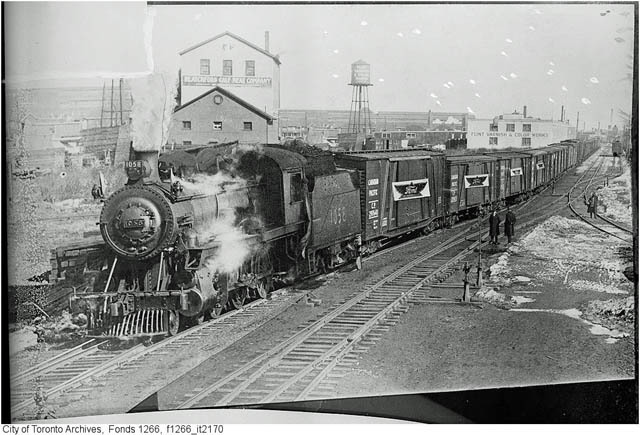 In 1885 the West Ontario Pacific Railway was incorporated to build from a point on the St.Clair River to a point on Lake Erie with a branch to Ingersoll or Woodstock. A May 1886 amendment provided for building Windsor to Chatham, 50 miles, to London 65 miles, and Ingersoll 22 miles. August 25, 1886 saw the CPR change this to connect at Woodstock with their CVR line from Toronto. Contract was let November 2nd which provided for a final grade of 40 feet to the mile, an easy .076% grade. The first train arrived in London on May 30, 1887, and was opened between Woodstock and London September 5, 1887, then leased to the O&Q. March 27, 1888 saw the original 8 directors (including one John Labatt), replaced by 13 CPR directors! 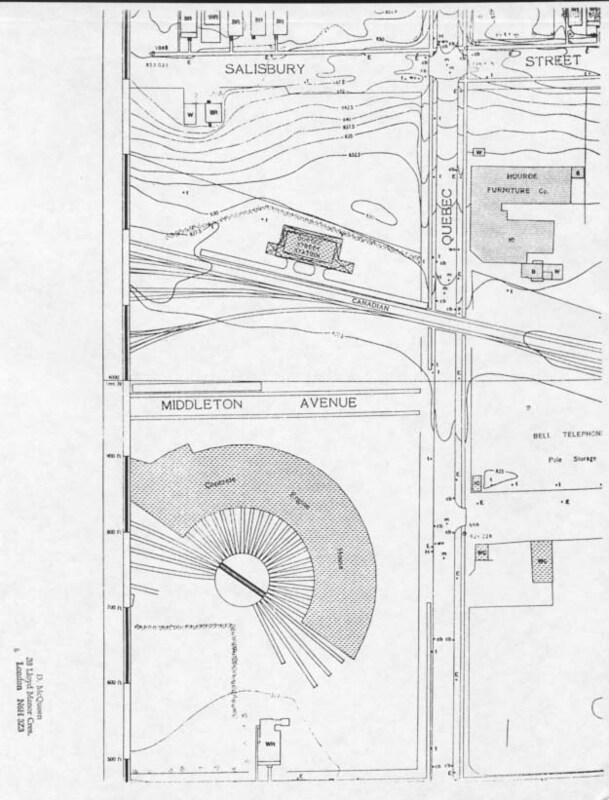 The original terminal in London was located on the east side of Adelaide Street at Central Avenue, where an 11-stall roundhouse with a 65 foot turntable was situated along with a station and yard office on the north side of the property. A new station was built in 1893 to the west at Richmond Street. 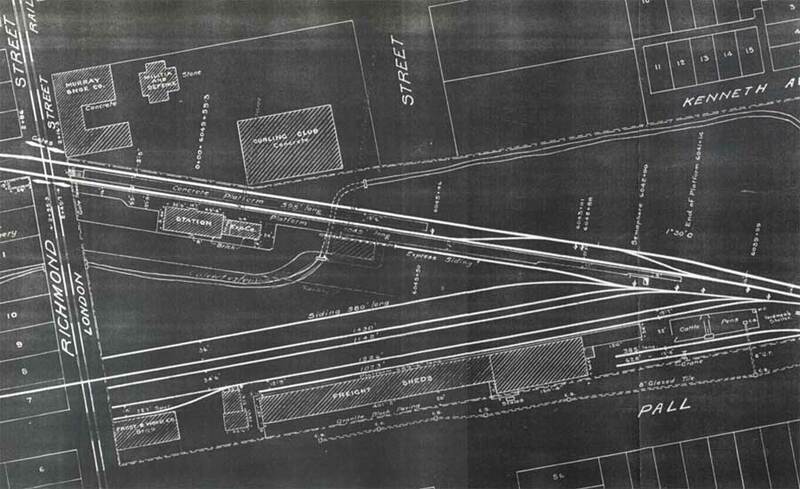 Between 1890 and 1912, Adelaide Street Yard was altered, until finally in June 1910 a new yard was started to the east, (prior to March 1885, this was London East), stretching to Quebec Street where a new 22-stall concrete roundhouse with a 70' turntable was built, along with a 60,000 gal. enclosed water tank replacing the earlier 40,000 gallon tank. London Terminal in 1921 stretched from Richmond Street in the west where the station and sheds were located, to Quebec Street in the east. The University of Western Ontario Archives. View from Quebec Street includes old service car. The old roundhouse, or at least part of it, remained in use by the Bridge and Building (B&B) department for many years. A station was also located at Quebec Street and remained in existence until 1962, having been used for many years as a yard office. 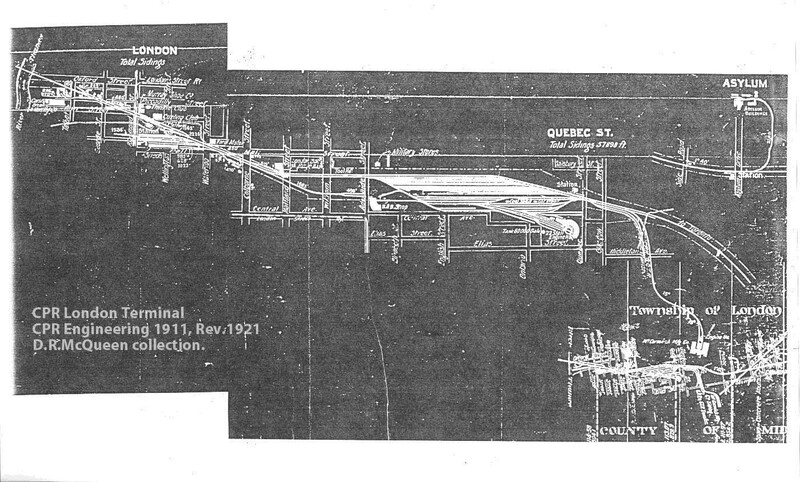 By 1921 Quebec Street yard had some 57,898 feet of sidings. Tracks in the marshalling yard consisted of two groups of six tracks each, 2380 to 2680 feet long. There was also an icing track, coach track, two repair tracks, and an auxiliary track. 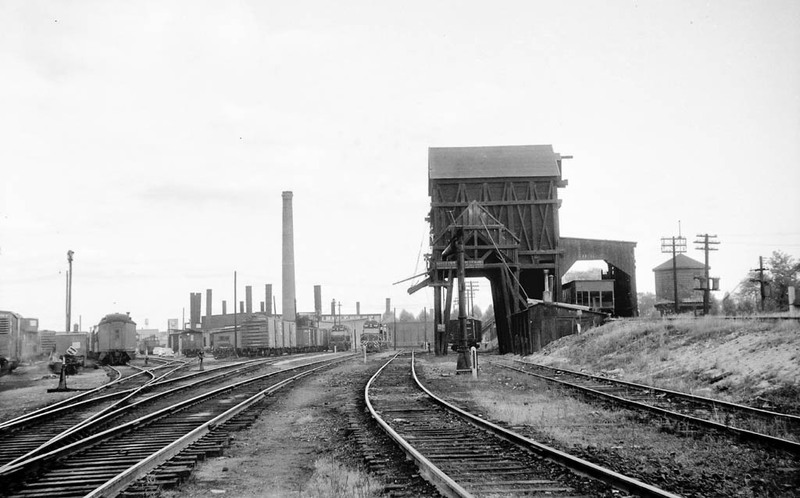 Two inbound and two outbound shop tracks, cinder track, stores track, coal (boiler house) track, and a coaling plant track that included a 443' trestle. There were also two team tracks behind the roundhouse and some other tracks. There was also provision for three more yard tracks to the north of the main line. It would appear from later maps that two of these tracks were eventually laid, but went much farther east beyond Quebec Street, one of them becoming the present main line. 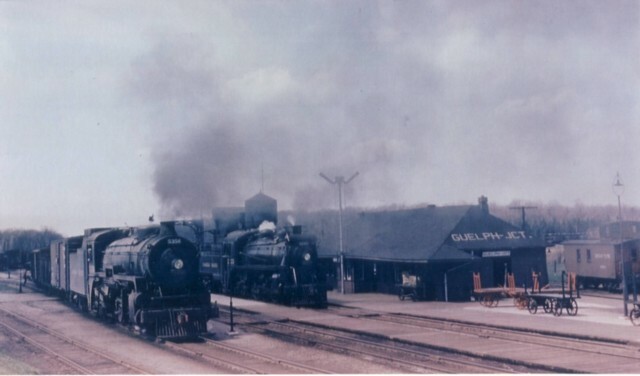 Since at least 1922 local management had been trying to get approval to expend $35,000 for a new 90-foot turntable due to difficulty obtaining a proper balance to turn P1 power then being used on the Galt Subdivision. Finally, a 100' turntable replaced the smaller one in January 1930. Quebec Street level crossing was over-passed in 1965. 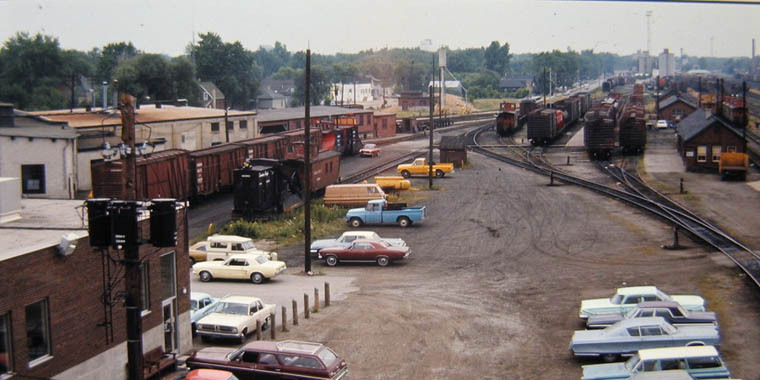 Some yard tracks were changed including removal of some of the shop tracks and shortening of the team tracks, until by 1991 yard capacity was shown as 1374 cars. A 1996 TRACK MAP shows two long tracks next to the mainline of 8400 and 7500 feet, while 14 yard tracks range from 1950-2450 feet. Another track one and three quarter miles long was added in the Fall of 2002 to the far side becoming the main line which became a passing track (rule 105) to aid in handling through trains during inspection, crew change etc. To further assist operations at this terminal CTC was extended in 2003 eastward to Nissouri (9 miles) where a signalled siding 10150 feet long was created out of the old 6350 foot non-signalled siding. Signalling permits a doubling of siding speed to 30 mph. A similar arrangement for Lobo, 6 miles west of London was planned but, cancelled. This is the only signalled siding on the Galt and Windsor Subdivisions. Most of the roundhouse was demolished with only four stalls remaining by December 9,1996 when further demolition left only a small portion (for the B&B). The turntable was dismantled in November 1996. 6701 at far left; 6700 next; wooden coal tower and water tank; 8031 on shop track. The CPR wanted its own track to reach the USA without depending upon the CASO at St.Thomas. In July 1888 the CPR under its O&Q charter sought an extension westward from London, 65 miles to Chatham, and on September 4th. a contract was let on the first portion of the "Detroit Extension". The line included a steep, but short grade just west of London to Hyde Park. It rose 53 feet per mile for a distance of 9000 feet, a 1% grade that reduced tonnage by 50%. From there on it was easy going with a maximum grade of only 18.5 feet to the mile. 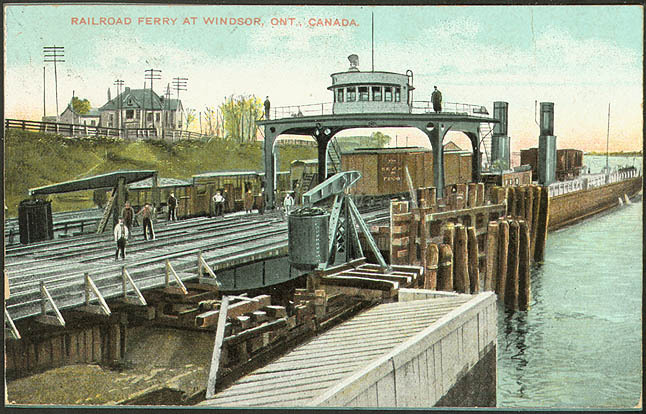 In April 1889 the CPR applied to build to Windsor which was reached in January 1890, and the line opened on June 12, 1890; where two CPR ferries connected with Detroit until 1916. These were later replaced by the Detroit River Tunnel, owned by CASO/MCR. 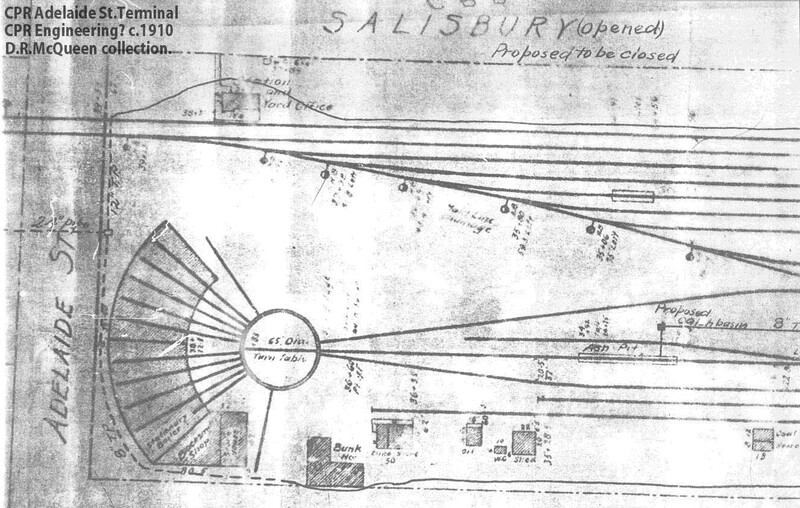 Construction of a new Windsor yard began in June 1910, and in June 1911 a contract was let for a 22-stall roundhouse with a 70' turntable. There was a planned double tracking, and a branch to Goderich or Sarnia, none of which happened. Two steel car ferries were ordered in 1889, each capable of carrying 16 freight cars on two tracks. The Ontario was built in Owen Sound by Polson Iron Works, which had recently launched the lake steamer Manitoba, the first steel ship built in Canada, for the CPR's service between Owen Sound and Fort William. 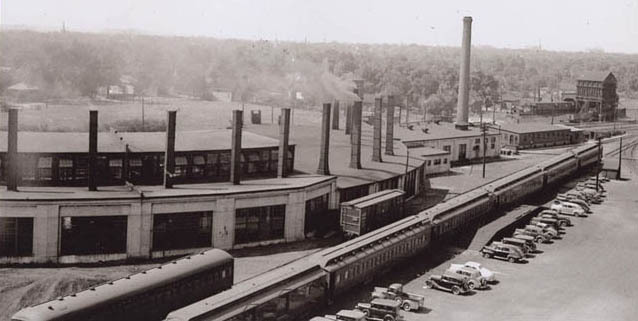 The engines and boilers were built in Toronto at Polson's plant and were the largest in Canada at 37 tons each! The other one, Michigan, was built by F.W.Wheeler & Co. of Bay City, Michigan. Pere Marquette Ry. ferry number 14 at CPR slip, foot of Elm Avenue, Windsor. c.1910. Another with 1624 5/30/1988 Kermit Geary Jr. The ferries carried passenger cars as well as freight, but it all ended in Detroit, instead of St.Thomas. What was lacking for the CPR was its own track to Chicago. The CPR supposedly had a chance to remedy this situation again during the Great Depression when the Wabash got into serious financial trouble. However, ever frugal, the CPR only wanted to buy the Detroit-Chicago main line, nothing else. Parent PRR did not sell the Wabash, and the CPR never acquired its own line to Chicago unlike its competitor CNR/GTW. It remains a problem to this day! Windsor Yard was always an important yard since this was where all freight trains began or ended their run until the advent of run-throughs into Detroit. Prior to this the US roads ran transfers over to Windsor, or traffic moved on car ferries. Pere Marquette used Windsor yard, (a portion of which still showed as P.M. Yard on the north side of the mainline) and was switched by CPR engines later known as the C&O Lead when the Pere Marquete was acquired by them in 1947. PM/C&O engines used the roundhouse. Tracks 1 to 9 on the south side show as C.P. Yard. A late commer was the DT&I which began running its own transfers from NYC's Flat Rock yard to Windsor Yard in 1968. Initially using GP38's which were soon found unsuitable for the tunnel grades they were replaced in 1969 with newly ordered SD38's. Roundhouse is down to only 4 stalls.7/28/1980. 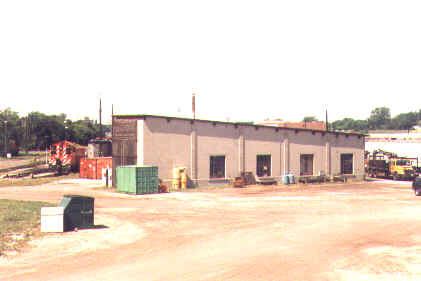 A one-spot Car Shop was built in 1973, and a new yard office in March 1975. A 2-track (12 cars each) Piggyback Yard between the old freight shed and CP Express, dates from 1964; later, 4 tracks of 10 cars each. The roundhouse was reduced to only 4 stalls (demolished June 2010), but retained its turntable. A 3 track auto compound was added near the roundhouse. 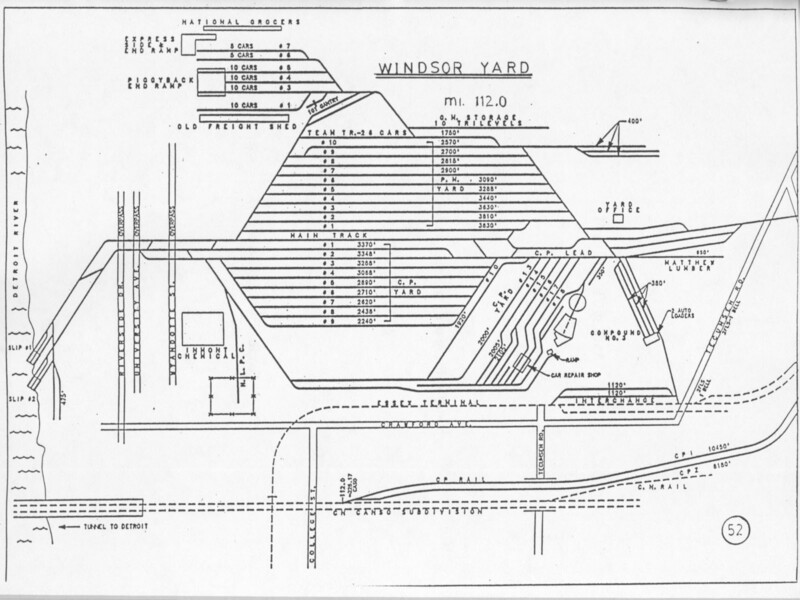 In 1991 Windsor Yard was shown as having a capacity of 1215 cars. The Windsor Sub. was upgraded to 115 lb. CWR 1969-1976 and slag ballast 1979-1987. The Interlocking with the ETR at M.109.9 was added to the CTC effective March 25, 1992 which abolished the operators jobs, some of the last of these positions on the CPR. It has been preserved as a private car. BC 6 Galt 1958 Bill Thomson Complete history. 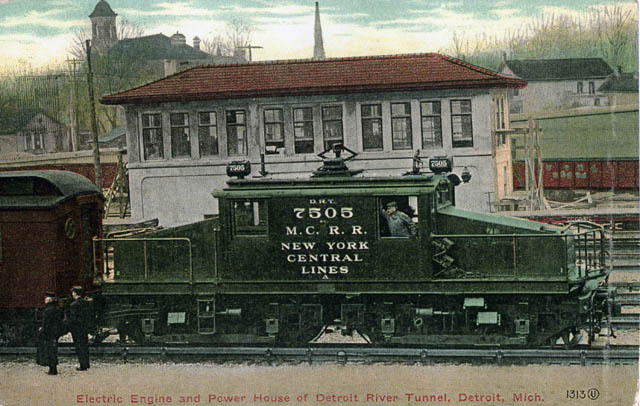 The Detroit River Tunnel Company (controlled by New York Central), opened tenders in March 1906 (and dredging began in October), to tunnel under the Border. The year before, four MCRR ferryboats were handling 1000 cars per day between Canada and the USA. The majority of these trains were NYCL which operated over the CASO between Windsor and Niagara Falls/Fort Erie. The tunnel was completed July 1,1910, and the first official trip was on July 26th. By September 15th all freight, and by October 16th. all passenger trains were using it except for the local Detroit-St.Thomas MCR train which continued using the old waterfront station until December 17th. The new station opened in April 1911. The ferries ceased to operate, were laid up until 1924, stripped of boilers, engines etc. and sold as pulpwood barges for use at Port Arthur. First electric locomotive. Article 1909. The tunnel operation was 600V DC 3rd rail electric from the beginning, unlike its earlier neighbour at Sarnia which struggled along with steam locomotives and a resulting number of deaths. The original locomotives were six 100 ton steeple-cabs rated at 51,590 t.e. built by ALCO-GE in 1909. Four 123 ton locos were added in 1914 and two 125 ton in 1927. Ten second-hand locos from other NYC operations came along in later years. The grade is 2.0% westward and 1.6% eastward. 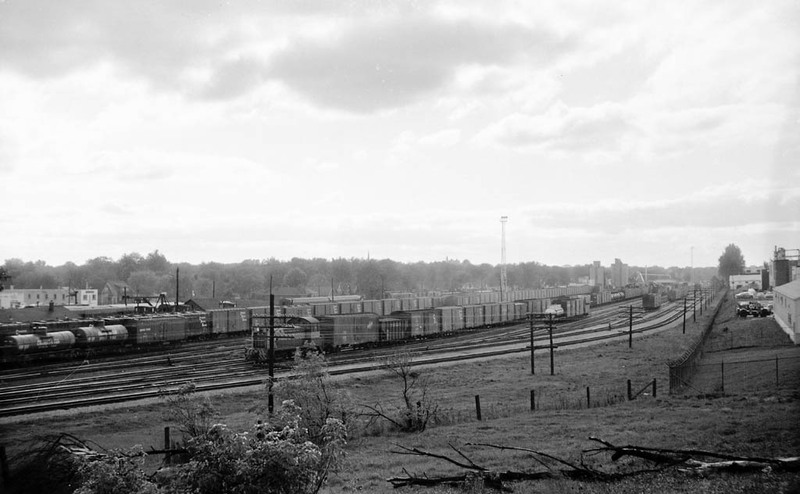 The operation was dieselized with 10 GMD GP7's, and the last electric operation was 12/29/53. For years a five-diesel unit set of "tunnel motors" hauled all CPR trains through the tunnel, even 1 or 2 RDC's!! They also assisted NYC trains through the tunnel. Finally, in the summer of 1963 the "Tunnel Jobs" were eliminated and the regular power and crews ran through the tunnel unaided. 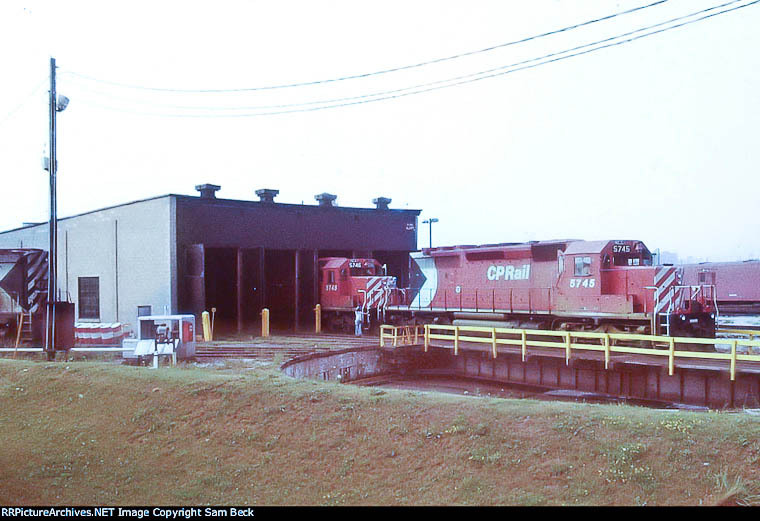 The 1985 sale of former CASO assets in Canada by Conrail saw the DRT owned 50/50 by CN and CP. 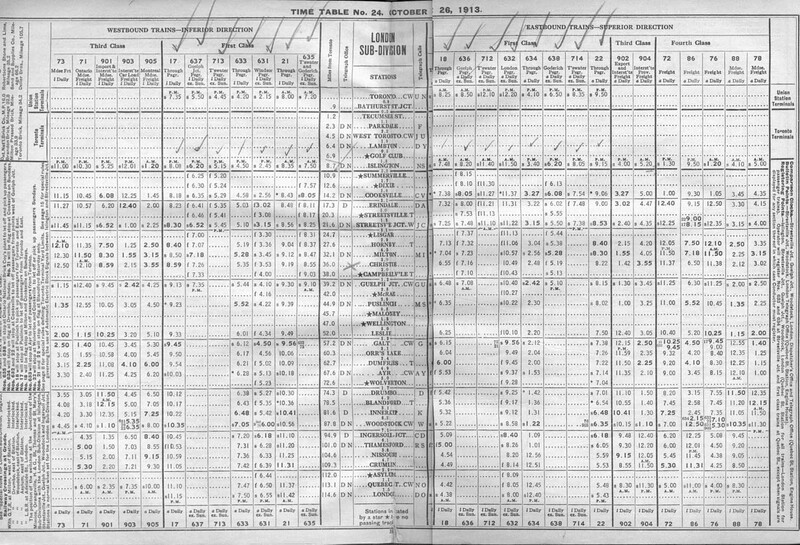 The major route for CN traffic was through Sarnia and Port Huron, while Windsor-Detroit was very secondary. 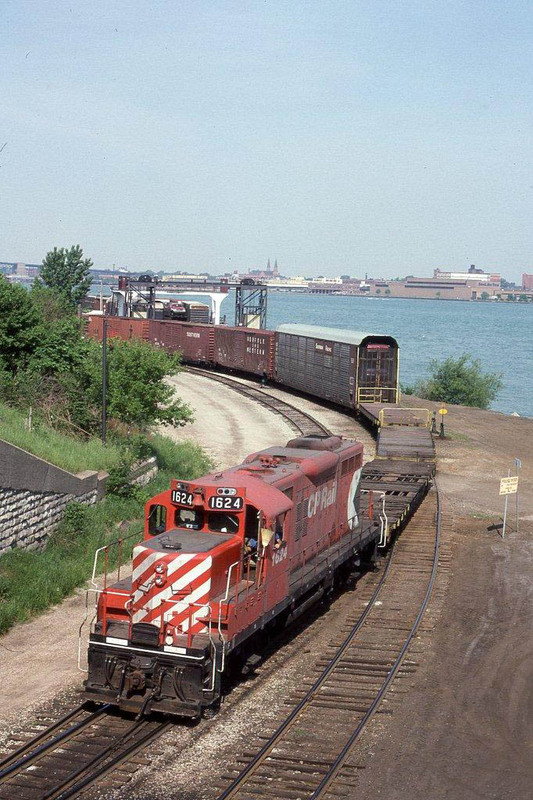 Therefore CN decided to build a new tunnel at Sarnia to replace its original one and to not share in the expense of enlarging the Detroit River Tunnel. Work began in November 1992 on a $27.5 Million enlargement of the north tube. It was re-opened April 19,1994 with a clearance of 19' 6". Although 20' 6" is needed for maximum height double stack containers, it was not possible to get any more clearance. 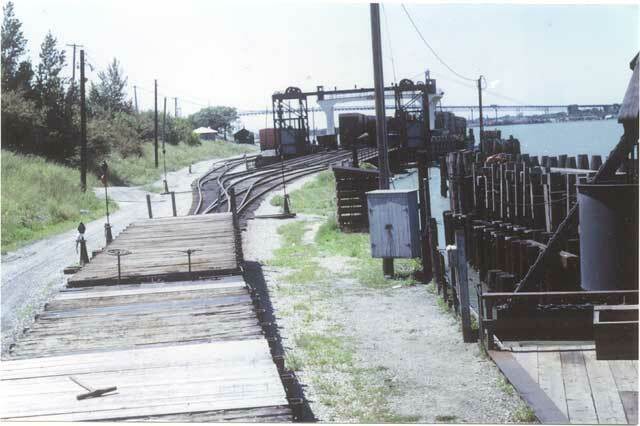 Ferry service finally ended May 1,1994 when Norfork Southern ended its car float operation. It began 140 years earlier with the Great Western car ferry in 1854! The CPR was able to enlarge one tube to handle multilevel auto carriers and containers, but not sufficiently to handle the very tallest containers. Plus, Roadrailer, Expressway, Frame train etc.